We have changed the way Attorneys look at legal software by focusing on the day to day business of a law firm. All modules exist within a single application, which increases your productivity and organization. Discover how The Legal Assistant would make your law office more productive. Below are just some of the amazing features we offer. All the features you need to manage all your incoming and outgoing mail and email. Rapid document assembly and distribution functionality with hundreds of default templates. Be kept in the know when you need to, watch cases for changes with notifications. The Legal Assistant calendar provides your firm with office and personal calendars. Let us host it for you in the cloud or install the software on-site at your office, the choice is yours. There is no steep learning curve and if you need help we provide extensive support! The Legal Assistant provides multiple modules running within the same centralized database, each one designed by attorneys with expertise in specific practice areas. 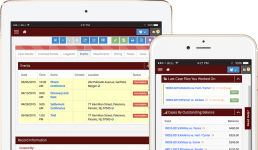 Whether you are a solo attorney looking to increase efficiency or a multi-lawyer firm focused on Customer Relationship Management (CRM), the Legal Assistant provides a reliable legal case management software package that is both technologically advanced, and easy to use. Your up-front investment is minimal due to our innovative monthly rental pricing, with an annual return on investment in the thousands of percent. Choose whether you want the Cloud version hosted by us, or would prefer the On-Site version and have the system and all data at your office location, select the modules and number of users you need and that’s it. You can see the Cloud version immediately when you start a free personal trial, then it’s up to you whether you wish to continue in the Cloud, or download the installer to your office server and run the system locally. Besides using a specific module for the type of case you are handling, the Generic Case Module, which is included free of any additional charge, allows you to handle various types of misc or general practice matters under this same software application. Designed by active Personal Injury attorneys, The Personal Injury Assistant module adds custom screens designed for Tort cases, notifications and hundreds of letters and forms immediately ready to use, guiding you through from case intake through to settlement. The Real Estate Assistant module lets you handle real estate closings and other related matters with ease, with custom databases, screens and forms all for the Real Estate attorney. I cannot imagine going back to my old system. The Legal Assistant software has allowed my practice to run much more efficiently and much more profitably. The Legal Assistant software has streamlined our real estate practice and has been an invaluable help. The support provided has been top of the line! Time saving from the system begins the first day you use it, and just keeps going up from there. It is very well designed by lawyers with many years of experience. I highly recommend it. I have been very happy using this program since 2004 and the latest updates with the auto billing, dictation, recorded reminders, timed delay reminders, amongst many others have truly blown me away. This product has been clearly designed with the lawyer in mind. "Very true to the Words, "Designed by Lawyers for Lawyers", what more can I say..."
The Legal Assistant can be tested within our fully functional demonstration sandbox immediately free of charge. With popup help and a guided tour for each new page you access, you will be able to get a feel for the program within minutes and see how quickly you can perform your day to day duties. If you're not sure how to do something, click the help button to get live one on one support. Pay for what you need, cancel anytime without contract. Costs are based on users and modules required with increasing discounts for multiple users.